9-20-2001 - ISLAMIC LEADERS OBJECT TO THE TERM 'INFINITE JUSTICE, AS ONLY ALLAH CAN BE INFINITE. THE NAME WILL BE CHANGED ACCORDINGLY BY THE U.S.
TOKYO (Reuters) - U.S. military bases in Japan buzzed with activity on Monday as forces here prepared to play their part in any retaliation against last week's attacks on New York and Washington. Bush approved the activation of up to 50,000 reserve troops last week, some 35,000 of whom were called up on Saturday to provide fighter protection and perform other duties at domestic military bases. And there were signs that preparations in Japan, home to about 48,000 U.S. military personnel -- nearly half the U.S. presence in Asia -- were intensifying. U.S. fighter planes conducted night time take-off and landing drills at an air base in Atsugi southwest of Tokyo on Sunday evening, and on Monday, a warship equipped with an Aegis missile defense system, the Curtis Wilbur, left a U.S. naval base in Yokosuka south of Tokyo. Japanese media also said that an unidentified U.S. submarine docked at Yokosuka and later departed. ``I really can't comment on operational movements of vessels or people. We are not commenting on the movements,'' said an official at the U.S. Forces public affairs office in Japan. A U.S.-guided missile cruiser, the Cowpens, another Aegis-type warship, is also said to have departed Yokosuka on Saturday. Analysts say the United States could also dispatch the aircraft carrier Kittyhawk to somewhere in the Indian Ocean together with several F-16 fighter jets. Kittyhawk -- one of 12 aircraft carriers the United States has around the world -- belongs to the U.S. 7th Fleet which covers the western Pacific and whose home port is Yokosuka. But analysts here say U.S. military forces in Japan are unlikely to play a major role in any U.S. retaliation against last week's terror attacks. ``The U.S. military stationed in Japan did not play a significant role in the Gulf War,'' defense analyst Haruo Fujii told Reuters. Fujii said U.S. troops and military hardware were deployed across Japan mainly to deal with possible conflicts in Northeast Asia or East Asia. ``They are not deployed here to be dispatched to areas far away from the region,'' he said. Fighter jets from South Carolina are headed out to sea. Three squadrons of F/A-18 Hornets are going to join the aircraft carrier USS Theodore Roosevelt. The carrier was scheduled to head to the Mediterranean Sea before last week's terrorist attacks. The F/A-18s are being dispatched from the Marine Corps Air Station in Beaufort. Charleston Air Force Base has also received an order to deploy aircraft as part of Operation Infinite Justice. Shaw Air Force Base in Sumter, S.C., has not received any such orders. Marines and sailors based at North Carolina's Camp Lejune were also deployed Thursday. The 2,200 troops who left will be gone for at least six months. Officials said that it is a routine deployment, but the timing makes it much more important. The troops will be based along the Mediterranean Sea. As Washington tries to build an international coalition against terrorism, the Bush administration is preparing the nation for a long campaign rather than a single retaliatory strike. With Afghanistan the primary initial target, Washington must deal with a problem it has rarely encountered since World War II: attacking a landlocked country. The Bush administration is searching the globe for coalition support for its war on terrorism. At the same time, it is preparing Americans for a long campaign that may not include a rapid, high-profile, retaliatory strike. Washington's initial military response to the Sept. 11 attacks will shape U.S. relations not only with Middle Eastern nations but also with the rest of the world. For this reason the administration must carefully consider its reprisal so as not to undermine the confidence of allies or fuel wider enmity among Arab and Islamic nations. Although strikes are inevitable, they will likely take much more time and preparation than the cruise missile strikes that followed the 1998 bombings of the embassies in Africa. By labeling Osama bin Laden the key suspect, Washington has also marked Afghanistan, where the Saudi exile has been living, as the likely first target. This presents a problem the U.S. military has rarely encountered since World War II: attacking a landlocked nation. 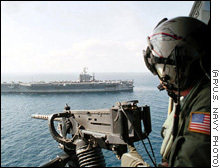 The effectiveness of U.S. carrier battle groups will be severely reduced in any operation against Afghanistan. The United States has experienced much success so far in forming a broad international coalition to fight terrorism following the Sept. 11 terrorist attacks. But frictions with vital countries such as Germany, France and Egypt could hamper America's ability to wage covert war. In some ways Sept. 17 was a bad day for American strategists. U.S. Secretary of State Colin Powell and others have made it clear the United States intends to prosecute the coming campaign against terrorism as it did in the Kosovo and Iraqi wars: with a broad, international coalition's backing. In terms of logistics, Washington must find either land bases for a sustained coalition air strike against Afghanistan or provide in-air refueling for carrier-based planes. Afghanistan's neighbors, with whom the United States has tenuous relations, limit both choices. Afghanistan is bounded by Turkmenistan, Uzbekistan and Tajikistan to the north, Iran to the west, China to the east and Pakistan to the south. Any partnership with the northern neighbors will require substantial negotiations with Russia, which retains a strong influence and military presence in Central Asia. Even with permission to fly out of Central Asia, the supply chain into these nations would be long and difficult to maintain. Iran, which has no love for the Taliban, is even more unlikely to offer basing for U.S. aircraft. China, too, is unlikely to offer basing, and even if it does, significant supply line problems would remain. Washington's best hope for regional assistance, then, is Pakistan. Pakistan was once a close ally, and its port access is useful for logistical purposes. Pakistan's long border along the southern and eastern parts of Afghanistan also offers the closest access to the cities of Kandahar, the Taliban headquarters, and Kabul, the frontline in the battle between the Taliban and the opposition Northern Alliance. Pakistani President Pervez Musharraf has offered substantial cooperation to the United States in the wake of the Sept. 11 attacks. But pro-Taliban forces inside Pakistan threaten his hold on power. These threats come from those who feel he is too secular as well as from ethnic rivalries within Pakistan. Musharraf is a Muhajir, an Urdu-speaking member of an immigrant family from India. Although Urdu-speakers have dominated Pakistan's political and economic elite, the many of the country's indigenous groups -- including the native Pushtun population, which geographically straddles the border with Afghanistan -- view them as usurpers. Even with Musharraf's promises of cooperation, military planners in Washington must be absolutely sure that he has control of his entire military. The main questions in Washington now are whether Pakistan's offer of assistance is firm and whether the government is stable enough to allow the United States to strike Afghanistan from Pakistan. Whether the U.S. military is based in Pakistan or not, simply flying over Pakistan on the way to Afghanistan poses a serious security challenge. First, bringing significant firepower to bear on Afghanistan requires Washington to bring in more carriers or -- for a sustained and more effective operation -- to establish land bases. The nearest places for such land bases are in India, Oman, Qatar and the United Arab Emirates. If the aircraft are launched from carriers, they will require in-air refueling somewhere over Pakistan. This presents a significant security risk: Tanker aircraft would provide a ready target for potential rogue elements inside Pakistan's army or air force. With the situation in Pakistan still uncertain, it would be hard for a U.S. military commander to confidently fly tankers over Pakistan. The loss of a single tanker to surface-to-air missiles or fighter aircraft would also lead to the loss of mission-bound aircraft that depended on the tanker for fuel. Similar problems pertain to operations not based on carriers. Because land-based aircraft generally have a longer combat radius, it is possible that flights from Oman, the UAE or Qatar could refuel over the Pakistani coast and still have the range to strike at Kandahar or other targets in Afghanistan. Operating from land bases in the Gulf or from India, however, would require a long buildup. It is for this kind of protracted operation rather than a quick retaliation that Washington is preparing. During a briefing Sept. 18, U.S. Defense Secretary Donald Rumsfeld reiterated the dominant theme in Washington now -- that this will be a new style of war, one that will be fought for a long time. Rumsfeld emphasized that this is "not a matter of a single event" nor a campaign against one or two terrorist leaders. Washington needed six months to gear up for Operation Desert Storm, and preparations for strikes on Afghanistan or other targets may take as long. Although pressure from within the United States for a retaliatory strike will grow, President George W. Bush currently enjoys high popularity ratings. His administration is much more likely to take the heat now rather than risk a disastrous attack that accomplishes little. If Washington could fully trust Pakistan's stability, it would likely have begun operations already. But the administration is making every effort to prepare a long-term strategy -- to avoid the appearance abroad and at home of a Clinton-esque strategy of launching an ineffective cruise-missile strike against some tents in Afghanistan as well as to avoid undermining tenuous relations with the Arab and Muslim world. This strategy may involve more carrier-based aircraft, land-based assets or even long-range strategic bombers from the United States and the island of Diego Garcia in the Indian Ocean. Such strikes will ultimately take place but only after the administration can overcome the logistical concerns posed by Pakistan's delicate political balance. WASHINGTON (Reuters) - With President Bush warning the hour for military action was near, U.S. heavy bombers and elite troops prepared on Friday to move within striking distance of Afghanistan. Defense officials said KC-135 tanker aircraft had set up an ''air bridge'' to refuel B-1 and B-52 bombers ordered to fly from the United States to the Gulf and Indian Ocean and confirmed that a senior Air Force general was now in the region to oversee any strikes. Washington has accused Afghanistan's ruling Taliban of harboring fugitive guerrilla leader Osama bin Laden, key suspect in the devastating Sept. 11 terror attack on America. Bush again warned the Taliban on Thursday night they faced attack if they continued to refuse to turn bin Laden over to the United States. He left open the possibility the military not only could hit Afghanistan, but bases used by anti-American guerrillas elsewhere in the Middle East. Officials at U.S. bomber bases in Louisiana, Georgia, Idaho and South Dakota refused to say whether their big planes, capable of dropping precision-guided bombs and firing long-range cruise missiles, had departed. The bombers were expected to fly to the Gulf and the British island of Diego Garcia in the Indian Ocean. A total of more than 100 U.S. warplanes, ranging from bombers to fighters and other support planes, were on alert to move to the region. The elite Army Special Operations Command at Fort Bragg, North Carolina, which could conduct attacks on guerrilla bases in Afghanistan and elsewhere in the Middle East, said its troops had been ordered to deploy. No details were given. U.S. officials, meanwhile, confirmed a report in The New York Times that Air Force Lt. Gen. Charles Wald, the head of American air forces assigned to the Middle East and southwest Asia, had been dispatched to the Gulf early in the week. They refused to say exactly where he was based, but the Times said he had been sent to run the air war from a sophisticated air operations center at Prince Sultan Air Base, near Riyadh, Saudi Arabia, that opened this summer. With two U.S. aircraft carriers already in the Gulf region and another on the way from the United States, the Navy will have more than 225 warplanes ready to take part in any attack or to support bomber aircraft. The U.S. Air Force already has nearly 200 warplanes based in the region and involved in patrolling a ``no fly'' zone in southern Iraq. Such massed air power could be used not only to attack Afghanistan, but guerrilla bases in Lebanon and elsewhere in the Middle East, as well as countries such as Iraq, which the United States has accused of supporting terrorism. Defense Secretary Donald Rumsfeld said on Thursday that Bush's declared ``war on terrorism'' would be a long-term fight. WASHINGTON (Reuters) - The Pentagon said on Thursday that 5,131 Air Force Reserve and Air National Guard troops had been ordered to active duty as part of a ``homeland defense'' mobilization authorized by President Bush. The activation was the first made under an order signed by Bush last week authorizing the call-up of up to 50,000 part-time armed forces troops in the wake of the Sept. 11 attack on the Pentagon and New York City's World Trade Center. Defense Secretary Donald Rumsfeld said in a brief announcement on Thursday the Air Force troops were from 29 units in 24 states and the District of Columbia. The mobilization was ordered by Bush to increase military protection of U.S. skies and seaports and to help civil authorities restore order after hijacked airliners were slammed into U.S. defense headquarters and both towers of the trade center. All of the units involved in Thursday's announcement were from fighter jet wings and air traffic control units to support high-alert status at 26 domestic military air bases to help protect the country from further air attacks. ``Operation Infinite Justice'' for the promised war on terrorism. WASHINGTON (AP) - The Pentagon is gearing up simultaneously to bolster the defense of U.S. territory and to expand the U.S. military presence in the Persian Gulf region. Both are in response to last week's terror attacks, and both require a call-up of the National Guard and Reserve. The Air Force said Thursday that more than 5,000 reservists had been called to active duty. They include a B-52 bomber unit at Barksdale Air Force Base, La., and a B-1 bomber unit at Robins Air Force Base, Ga., both of which are expected to fly to forward bases in the Gulf area. Some of the reserves are from fighter units to be used as extra defenders of U.S. airspace. Defense Secretary Donald H. Rumsfeld said Thursday that although the Gulf is the focus of U.S. deployments right now, the coming fight will look nothing like the knockout punch U.S.-led forces delivered in the 1991 Gulf War. ``What we're engaged in is something that is very, very different from World War II, Korea, Vietnam, the Gulf War, Kosovo, Bosnia, the kinds of things people think of when they use the word `war,' or `campaign,' or `conflict,''' Rumsfeld said. Rumsfeld said the American campaign will not mean the end of terrorism. ``I think what you can try to do is to go after this worldwide problem in a way that we can continue our way of life,'' Rumsfeld said. ``It strikes at our way of life, and while we may not eliminate it completely from the face of the Earth, which we surely will not,'' it can be better controlled, he said. The Air Force announced that 5,131 members of the Air Force National Guard and Air Force Reserve have been ordered to active duty. They are from 29 units in 24 states and the District of Columbia. ``No other single action more clearly demonstrates the national resolve than to mobilize the National Guard and Reserve forces of America,'' said Craig Duehring, the Pentagon's chief of reserve affairs. Rumsfeld has said he expects 35,500 members of the Reserve and National Guard to be called up. The Pentagon is repositioning military forces to prepare for action, Rumsfeld said, but would not provide details. Other officials said both active and reserve forces are beginning to move. The Air Force is sending 100 to 130 aircraft to the Gulf region, a senior defense official said, including fighters and B-1 and B-52 bombers. Also, tanker aircraft began deploying from U.S. bases Thursday to establish an ``air bridge'' for refueling fighters and bombers as they cross the Atlantic. The Air Force has fighter aircraft in Saudi Arabia and Kuwait, and the Army keeps a virtually permanent presence in Kuwait with soldiers and war materiel sufficient to equip an additional 5,000 troops. The Navy's 5th Fleet headquarters is on the Gulf island emirate Bahrain, and it normally keeps one aircraft carrier on patrol in the Gulf year-round. It now has one in the Gulf and one nearby in the Arabian Sea; a third - the USS Theodore Roosevelt - left port at Norfolk, Va., on Wednesday en route to the Mediterranean. Each carrier has 75 aircraft aboard and is accompanied by a dozen warships. Early Friday in Japan, the USS Kitty Hawk, the only U.S. aircraft carrier stationed in the western Pacific, left its port in Yokosuka for an undisclosed location. The carrier has a crew of 5,500 sailors, naval aviators and Marines and typically carries 70 aircraft. A contingent of about 2,100 Marines also is in the Gulf, and a similar-size unit is headed in that direction. White said a deployment order Rumsfeld signed Wednesday is only the first step in a bigger plan. ``A lot more will come,'' he said. Air Force refueling aircraft began deploying Thursday, including KC-135s from Fairchild Air Force Base, Wash., officials said. Grand Forks Air Force Base, N.D., with KC-135 refueling planes, also received deployment orders. Officials at neither base would offer additional details. OTIS AIR FORCE BASE - Ten days after the terrorist attack on the World Trade Center towers, the Pentagon called the first Massachusetts military reservists into active duty yesterday from Otis Air Force Base in Falmouth. 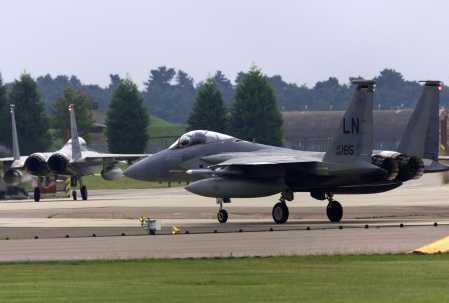 The 161 reservists belong to the 102d Fighter Wing and are trained to operate F-15s. But the contingent is expected to remain under command of NORAD on homeland defense, not deployed overseas, according to US Senator John F. Kerry's office. The activation is part of a national call-up of the Air National Guard and Air Force Reserve announced yesterday by Secretary of Defense Donald H. Rumsfeld. As soon as the activation papers arrive, the reservists are required to report to Otis for work instead of their civilian jobs. All together, 5,131 members of the Air National Guard and Air Force Reserve from 24 states and the District of Columbia have been ordered to report to active duty as part of the partial mobilization authorized by President Bush. Right now, most still don't know who has been called. The activation is the first for the 102d in more than half a century, Quenneville said. While 360 members of the air wing went to help patrol the no-fly zone over Iraq last fall, none of the group was called into active duty during the Gulf War. The last time the wing was activated was in 1948, when it helped fly food into Germany during the Berlin crisis, Quenneville said. The 102d now specializes in air-to-air combat. ''No other single action more clearly demonstrates the national resolve than to mobilize the National Guard and Reserve forces in America,'' said Craig Duehring, a spokesman for the reserves. Globe correspondent Brian Tarcy contributed to this report. This story ran on page A30 of the Boston Globe on 9/21/2001. WASHINGTON - The United States yesterday escalated its military buildup in the Middle East, ordering Army units to prepare for commando strikes and ''sustained land combat'' while scrambling Air Force B-52s and refueling tankers that will eventually create an ''air bridge'' for troops, weapons, and materiel. The intensifying air, naval, and troop movements are aimed at allowing the Pentagon to pursue anything from a pinpoint assault on terrorist encampments to a late-winter ground invasion of Afghanistan to simultaneous air and ground attacks in multiple Mideast nations, officials and analysts said yesterday. Military maneuvers came as the Bush administration continued diplomatic efforts to sign up governments around the world to support a massive retaliation against terrorist groups. But President Bush found himself in a standoff with the ruling Taliban in Afghanistan, whose senior clerics said they had voted to ask suspected terrorist mastermind Osama bin Laden to leave the country, but set no deadline. ''We want action, not just statements,'' Secretary of State Colin Powell said. The Air Force is deploying a reported 100 to 130 warplanes to the region over the next week, including B-52s and KC-135 tankers from bases in Louisiana, North Dakota, and Washington state. Officers with B-1 bomber units in Idaho and South Dakota also said they were being called up for unspecified deployment. The Pentagon on Wednesday had said it will deploy up to 100 aircraft to the region. Warplanes being sent to the Gulf region will be preceded by ''airlift control'' specialists mobilized from Air Force bases in California and New Jersey. Their job is assembling operations, including midflight refueling, to create an ''air bridge'' from the United States to bases 8,000 or more miles away. India has offered three of its air bases in Gujarat, Kashmir, and Punjab - northern states that border Pakistan - for US use, according to a Times of India report. The Air Force deployments, along with the dispatch Wednesday of the USS Theodore Roosevelt carrier battle group from Virginia, would bring the number of US warplanes in the region to 500 or more, including fighter jets and bombers. The Roosevelt fleet includes 2,100 Marines aboard a battle-ready unit known as an Amphibious Ready Group, led by the assault ship USS Bataan, and two attack submarines packing Tomahawk cruise missiles, the USS Hartford and the USS Springfield. Already, the Navy has the USS Carl Vinson carrier battle group in the Persian Gulf and the USS Enterprise in the Arabian Sea, which, like the Roosevelt, both have about 70 warplanes. About 2,200 Marines and sailors with the 26th Marine Expeditionary Unit at Camp Lejeune, N.C., were bused to the port in Morehead City for a deployment to the Mediterranean Sea. The ''flexible unit,'' which carries tanks and humvees, is trained for urban and mountain warfare. At Fort Bragg in North Carolina, officials confirmed that an unspecified number of the 9,000 Army special operations troops there are being deployed. Units there include a ''psychological operations'' unit that would use broadcasts and dropped leaflets to communicate with civilians in a country being invaded. The Army's 82d Airborne unit, which parachutes into combat situations, resumed jump training Monday and is awaiting orders to deploy on as little as 18 hours' notice. More than 5,100 Air Force reservists and Air National Guard fighter-jet and air traffic control troops from 24 states were reported to be called up for ''homeland defense'' duty in the first mobilization of reservists since the Sept. 11 terror strikes. Among them are 160 airmen with the 102d Fighter Wing at Otis Air National Guard Base on Cape Cod, whose unit has six F-15s, and the 139-member 158th Fighter Wing in Burlington, Vt.
Goure, who was a Pentagon aide under President George H.W. Bush, said that if a mass invasion of Afghanistan comparable to the 1991 invasion of Iraq is in the works, it would take at least 90 days to prepare. Goure noted that in the Gulf War, US and allied forces needed 90 days to assemble an Iraq-bound force in Saudi Arabia. That was a friendly nation with considerably better military infrastructure and political support than Pakistan. Goure said that although Pakistan is the most geographically optimal base for US ground-force operations, its leaders and people have deep reservations about hosting US-led military forces. Rumsfeld and other defense officials refused to confirm or deny a report in yesterday's Washington Post that aircraft would not only go to the Gulf region and the Indian Ocean but - in an unprecedented move - to the former Soviet republics of Uzbekistan and Tajikistan near Afghanistan. Globe Correspondent Patrik Jonsson in North Carolina, and Douglas Belkin and Beth Daley of the Globe Staff contributed to this report. Material from wire services was also used. Peter Howe can be reached at howe@globe.com; Robert Schlesinger at schlesinger@globe.com. This story ran on page A1 of the Boston Globe on 9/21/2001. WASHINGTON (AP) - Whether it would begin with cruise missiles from Navy ships, bombs from Air Force jets or quick strikes by Army special forces, an American attack on Afghanistan's Taliban probably would aim to knock out airfields, communications links and other targets that sustain the religious militia. War on the Taliban would be like little the U.S. military has undertaken before. But at least it would offer more of what Defense Secretary Donald H. Rumsfeld calls ``high-value'' targets than would the shadowy terrorist network of Osama bin Laden that President Bush (news - web sites) has promised to root out. Bush told the nation the Taliban are ``committing murder'' by aiding the terrorists who attacked the World Trade Center and the Pentagon . Bush demanded they turn over bin Laden and other leaders of his al-Qaida organization or face swift punishment. Taliban leaders, who have given refuge to bin Laden since 1996, say there is no proof he was behind the terror attacks, and on Friday they rejected Bush's demand that they hand him over. In addition to U.S. forces, Rumsfeld spoke Friday of the potential for enlisting the help of the Northern Alliance, the main Afghan resistance group opposing the Taliban. ``These folks, they know the lay of the land, they know, in some cases, some targets that are useful, they have ideas about how to deal with the Taliban,'' he said in an interview on Fox News. Bush made clear that his first priority is smashing the al-Qaida network, but he is assembling forces in the Persian Gulf region that would provide plenty of air power to strike at the Taliban, too. Much of that firepower - including two aircraft carriers (and a third on the way), B-52 bombers, warships capable of launching ground-attack Tomahawk cruise missiles, and fighters - would appear to have little relevance in the hunt for bin Laden. The Clinton administration fired dozens of cruise missiles at bin Laden's training camps in 1998 but accomplished little more than smashing empty tents. It is widely expected that a U.S. campaign against the terrorists would be led by special operations forces such as helicopter-borne Army Rangers. Important, too, would be nonmilitary means such as financial steps to dry up bin Laden's resources, and law enforcement moves against his accomplices. If Bush decides to attack the Taliban, one of the most attractive targets would be the civilian-military airport in Kabul, the capital, and a Taliban garrison in the north of the city. The regime flies MiG fighters and helicopter gunships from this airport. - The airport in Kandahar, the city in southeastern Afghanistan where the Taliban leaders are based. - The airport and Taliban military bases located in and around Jalalabad, a city in eastern Afghanistan near the Pakistan border. There are similar bases north of Jalalabad in Kunar province. - Communications towers on the outskirts of Kabul. - A military academy near Kabul. - A large dam near Sarobie that provides electricity for the Kabul area. It is possible the administration would opt, at least initially, for equipping and assisting the Northern Alliance rather than intervening directly with U.S. ground forces against the Taliban. Rumsfeld seemed to suggest this possibility in the interview Friday with Fox News. He noted the historic examples of the Soviet Union and the former East European communist regimes. ``It was a surprise that at a certain moment the people there who did not agree with those regimes felt it was the right moment and they stepped forward and they acted on their own. It was not some country going in and rooting it out,'' he said. ISTANBUL (Reuters) - NATO (news - web sites) member Turkey said on Saturday it had granted a U.S. request to use Turkish airspace and airbases for U.S. transport aircraft in any response to the September 11 attacks on New York and Washington. Turkey also said it was increasing its support to anti-Taliban forces in northern Afghanistan. ``The prime minister said the Turkish government had responded positively to an American request to use Turkish airspace and Turkish airbases for U.S. transport aircraft whenever necessary,'' a statement issued by Prime Minister Bulent Ecevit's offices said. It was the first pledge of specific support from Turkey, though it had already vowed full cooperation with the United States as it builds up its forces. The statement did not say what kind of transport planes would be involved, but Ecevit said late on Friday it was ''natural'' for the United States to want to use Turkey for flyovers and refueling. Turkey already allows U.S. and British warplanes to use a base at Incirlik in southeast Turkey for patrols of a no-fly zone over neighboring northern Iraq under ``Operation Northern Watch.'' There are also large military airbases in eastern Turkey near the cities of Diyarbakir and Malatya. Overwhelmingly Muslim Turkey is NATO's most easterly member and borders Iraq, Syria and Iran. It is also a candidate for EU membership. Ecevit said on Friday that any ground action in Afghanistan would be unwise and Turkey was not prepared to offer troops for it. But he stressed the importance of the anti-Taliban forces of the Northern Alliance in the north of Afghanistan, as did Saturday's statement. The statement, outlining the contents of a letter Ecevit sent on Friday to President Bush, said that Turkey favored sharing intelligence with the United States on the state of play among a diverse group of anti-Taliban forces mainly in the north of Afghanistan. ``The prime minister pointed out that it would be helpful for Turkey and the United States to exchange and cooperate in information about developments in northern Afghanistan,'' it said. ``Turkey will increase the equipment, training and other assistance that it has been giving to the Northern Alliance,'' the statement said. Turkey maintains links with a number of military leaders in the loose-knit Northern Alliance, most prominently with General Abdul Rashid Dostum, an ethnic Uzbek leader. Afghan opposition forces said on Friday that troops under Dostum had joined attacks on Taliban forces in the north of the country. WASHINGTON (Sept. 29, 2001) - The disclosure that U.S. special operations forces have conducted missions inside Afghanistan in recent days suggests the Pentagon's attack plan is still evolving. ''It is very hard to fight a ... guerrilla war with conventional forces,'' he told reporters at the White House. He refused to discuss details but said, ''Make no mistake about it - we're in hot pursuit'' of terrorists. The Pentagon, meanwhile, announced that Defense Secretary Donald H. Rumsfeld had authorized the Air Force to activate as many as 20,000 reservists - 7,000 more than the Air Force had said it expected to need when Bush approved a partial mobilization of reserves on Sept. 14. The Pentagon also said the Marine Corps called to active duty 191 reservists - as individual extras, rather than as whole units - and the Navy called up 250 for law enforcement, security and other duties. In all, more than 16,600 military reservists have been called to active duty since Sept. 14. Also on Friday, the president of the Air Line Pilots Association, Duane Woerth, said he has seen indications that the Pentagon is considering activating the Civil Reserve Air Fleet, an arrangement with commercial air carriers which allows the Pentagon to use their planes in times of emergency. ''I think that they've started circulating notices'' to airlines ''so they can start making some plans,'' Woerth said. A Pentagon spokesman, Air Force Lt. Col. Mike Milord, said he was not aware of any plan to activate the Civil Reserve Air Fleet. One of the U.S. military's likely first steps in pursuing the elusive bin Laden and elements of his al-Qaida network in Afghanistan is establishing what military officials call ''ground truth'' - getting the lay of the land and listening and watching for information on al-Qaida's leaders and supplies. One way to do that is by using the Army's Special Forces, commonly called the Green Berets. One of their core missions is ''special reconnaissance.'' That frequently means infiltrating enemy territory by land or air and hunkering down to keep watch on a particular place or area, with the capability of remaining there undetected and without the need to be resupplied for days, weeks or even months. It's a mission they performed in the run-up to the 1991 Gulf War. TASHKENT, Uzbekistan (Reuters) - The president of the Central Asian state of Uzbekistan agreed Monday to open his country's airspace to U.S. military operations against possible targets in Taliban-ruled Afghanistan. State television showed Islam Karimov chairing a meeting of Uzbekistan's top security officials at which he voiced support for Washington in its self-declared war on terrorism following the September 11 hijacked airliner attacks in the United States which killed thousands. ``Uzbekistan supports the decisiveness of the United States and all peace-loving nations to finish this evil and plague of the 21st century,'' the television quoted Karimov as saying. Officials in Tashkent had earlier declined comment on the reported arrival of U.S. aircraft and diplomats in Uzbekistan. Lying directly north of Afghanistan, Uzbekistan was the launch pad for the Soviet Union's ill-fated 1979 intervention. With Washington saying it intends to drive Osama bin Laden (news - web sites), prime suspect for the attacks, out of Afghanistan, Karimov's announcement indicated that Uzbekistan was readying itself to play a key role again in Big Power intervention in the region. His country could offer huge benefits to the United States as a base for operations against Afghanistan. Tashkent airport is Central Asia's largest and most sophisticated. Airbases at Tuzel, Kakaidi and Khanabad, can handle heavy aircraft. And the border town of Termez, site of the bridge over which Soviet troops entered Afghanistan in 1979 and left in 1989, is just 60 km (under 40 miles) from Mazar-i-Sharif, the scene of heavy fighting between Afghanistan's ruling Taliban militia and the opposition Northern Alliance. The authoritarian Karimov, who has ruled Uzbekistan since independence from the Soviet Union in 1991, stands to gain. He blames Islamic rebels which he says are funded by Afghanistan for entering Uzbekistan from neighboring Tajikistan and Kyrgyzstan in recent years, in an attempt to set up an Islamic state in the region. He has staged crackdowns on the country's Islamist opposition after surviving a 1999 attempt on his life. Karimov, whose country is a member of the Russian-led Commonwealth of Independent States, may possibly have informed Russian President Vladimir Putin in advance of the offer he was about to make to the United States. The Kremlin said Sunday that he and Putin discussed by telephone ``practical issues of mutual action'' by their two countries in the fight against international terrorism. Rumors have swept Uzbekistan for days about U.S. aircraft flying in and out, without confirmation forthcoming either from Uzbek officials or U.S. diplomats in Tashkent. Sunday evening, for example, Russian television reported that a U.S. C-130 Hercules military transport plane had landed at Khanabad, an airbase some 250 miles southwest of Tashkent. A defense ministry spokesman refused to comment. Friday, an aviation official in neighboring Kazakhstan told Reuters a U.S. C-37 military plane carrying a government delegation had overflown Russia and Kazakhstan on its way to Uzbekistan. The Uzbek Foreign Ministry would not comment, and the U.S. embassy denied a delegation was in Tashkent at all. The previous Friday, airport sources in Tashkent told Reuters, two U.S. military aircraft had landed there and taken off two and a half hours later. Even now, more than a week later, Uzbek and U.S. officials will not confirm or deny this. 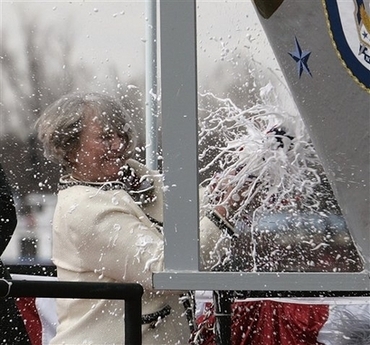 Dorthy England cracks a bottle of champagne against the hull of the New York in christening ceremonies at Northrop Grumman shipyard in Avondale, La., Saturday, March 1, 2008. Approximately 7.5 tons of steel recovered from the World Trade Center are cast in the bow stem of the ship. The bow stem is the foremost section of the ship's hull on the water line. The New York will be officially commissioned in New York City in the fall of 2009.